The LARC method is step by step process that brings the right (creative) side of your brain into play with the left (logical) side. Each phase of the program suggest specific, easy-to-follow techniques. The technique comes from the book Unleasing the Right Side of the Brain by Robert Williams and John Stockmyer, published by The Stephen Greene Press in 1987. 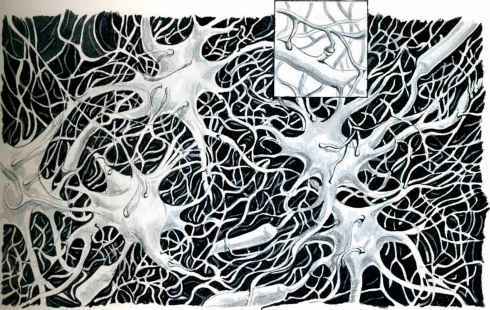 The right brain can be stimulated using drawing and visual images. There are four versions of LARC and each is a complete system for the stimulation of creative ideas. LARC 1 and LARC 2 are quick sets of exercises that can prompt imaginative solutions to many problems. LARC 3 and LARC 4 are more complex, take more time, and are to be used for more difficult problems or when it is necessary to find even more inventive ideas than those produced by LARC 1 and LARC 2. Each LARC version builds on the previous version. Draw pictures of each word or concept you will use in the technique. Draw specific pictures for specific terms (house, schol) and symbolic pictures for symbolic terms (destruction, love). Draw several pictures from different angles, perspectives, etc. for each word. Use onf of the four following lists - active, passive, simple, complex - to generate fact-bits from your terms. The simple lists of smashing questions are for "easy" problems, the complex for "harder" problems. Passive questions work besy when smashing subjects or terms have no independence of action, or cannot act on their own. Conversely, active lists are for smashing terms that can control their actions - people, animals, organisations. It doesn't really matter too much about the lists, because the questions are designed to stimulate ideas. If you are not sure about simple or complex, use the complex list.